Most parts of Uganda , the average maximum temperature is between 20°C and 30°C during the day, and the minimum between 12° C and 18° C at night. This makes the country a true nature and wildlife paradise for animals to therive, as it guarantees the best conditions for the thriving of both the flora and the fauna that are typical of this region. Uganda receive an annual rainfall between 1000 and 2000 mm (except in the drier north, where in some areas the average annual rainfall is as low as 100 mm), with a wide regional variation in rainfall patterns. However the wet seasons are from September to October and April to May. That said, it is possible to travel the whole year round: rain usually means a heavy shower for 1 hour and then the sun takes over again! Rwanda has a similar climate and is part of the great Rift Valley: The lakes and hills are a result of this geological phenomenon. Rwanda used to be covered with tropical rainforest, but in the last hundred years forest coverage has decreased due to population growth. However, it is still possible to visit the amazing Nyungwe Forest , and the beautiful valley where the Akagera meanders. Here you can still explore and admire the original beauty of the nature of Africa. African people have long known that gorillas lived in the forests. To the rest of the world, however, gorillas have been mysterious and largely unknown for centuries. All that changed in the early fifties of the previous century. In 1951, the American zoologist George Schaller was the first to study gorillas in the Virunga volcanoes. His pioneering work revealed for the first time the true nature of the gorilla to the world; a shy, gentle, peace-loving vegetarian. Schaller is the author of the book 'The Mountain Gorilla: Ecology and Behavior', published in 1963. In 1988 he wrote 'The Year of the Gorilla'. Dr. Dian Fossey and her assistants achieved some amazing results in their studies. Fossey lived among the gorillas from 1963 until her death in 1985. She followed Schaller's methods of research. Her book ‘Gorillas in the Mist' was eventually turned into a movie. After she spent some time in Congo she moved to Rwanda , where she started the Karisoke Research Center. She lived there for almost 18 years among the gorillas. She was the first person ever to have voluntary contact with a gorilla, one of them even touching her hand. During her visits to the region, Fossey would often stay at Travellers Rest Hotel in Kisoro (now under Gorilla Tours' direct management), which she once defined as her "second home". Fossey was killed in 1985 and was buried on the Rwanda side of the Virungas among the 17 gorillas that had been killed by poachers during her studies. Today, her Gorilla Fund continues to prevent the ongoing threats. Fossey's work has raised the world's awareness to the dangers that the mountain gorillas face. These animals are now protected by the governments of Rwanda and Uganda and by other international organizations. Uganda and Rwanda have much more to offer besides mountain gorillas!National parks here are home to an enormous variety of wild animals, such as giraffes antelopes, elephants, lions, leopards, buffaloes, zebras and many more. The many lakes and the river Nile are also home to hippos and crocodiles. 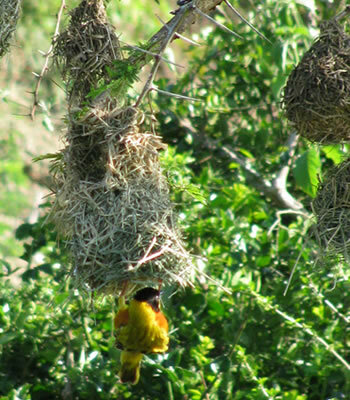 Uganda and Rwanda are also a birdwatcher's paradise . The region is home to more than 1000 species of birds, and on any of our safaris you may easily get to see more than 350 of them. Depending on your interests in wildlife and nature in the region we can organize any tour to satisfy your curiosity. 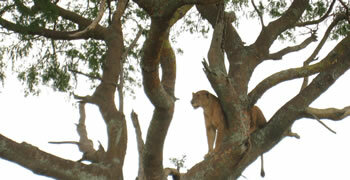 See our example tours for more information, or create your own tour in collaboration with Eco specialists Tours Uganda.